Though some people read the Bible out of a sense of obligation—and granted, sometimes we have seasons where we just need to push through—others read its words to inform their daily living, among other things. Yet, we must exercise care in how we apply God’s Word to our lives. Enjoy the Narrative: As we read the Bible, we are best to read it as narrative rather than a book of rules. Granted, the Law of Moses is prominent in four of the Bible’s first five books, yet we don’t follow the Law’s 613 commands anymore. As a narrative we may see the Old Testament Law as a modern-day principle to live set apart from the world and to worship God as holy. In reading the Bible as narrative we can revel in the story of the historical records, ponder the message of the prophets, contemplate the meaning of the poetry, consider the application of the epistles (letters), and marvel in awe at the end times passages. Consider the Context: We would be in error to pull the words of the Bible out of their historical setting and apply them literally to our modern-day situation. This is most apparent when considering the instructions in the New Testament’s various letters. Each one was intended for a certain group of people to address specific issues. If we take these targeted instructions and turn them into generalized commands, we misapply the scriptures. Plus, we will find conflict, for what Paul tells one group to do for their certain situation sometimes goes against what he tells another group to do for theirs. Only when we consider the context of each passage can we rightly discern the truth as it relates to us today. Just because someone in the Bible did something, doesn’t mean we should do likewise. Just because a command is given to one person doesn’t mean it applies to us. Context is crucial. Embrace the Genres: The Bible is a compilation of works by different authors, writing distinct types of literature. As such, the Bible includes biographies of Jesus, the early history of his church, a collection of letters (which address questions and problems we can only guess at), future-focused allusions, sagas of epic proportions, poetry of wisdom and poetry of prayer, and warnings from the prophets. Each one carries a different intent, which we need to treat as such as we read. Just as it would be unwise to turn one of David’s prayer laments into a command for action, it would be likewise foolish to take what God said to one person in an history passage and apply it to us today. Apply the Examples with Care: Scholars make a smart distinction between descriptive passages and proscriptive passages. That is, the portions of the Bible that tell us what happened do not equate with the texts that tell us what to do. Just because the Bible describes something occurred, doesn’t mean we should do the same. Though the Bible tells about spitting on people, pulling out their beards, ostracizing them, and killing them, we shouldn’t. For example, consider the description of what Nehemiah did to men who disobeyed: “I beat some of the men and pulled out their hair (Nehemiah 13:25, NIV). We would be wrong to assume this is how we should treat people in our churches when they do wrong. Employ Prayer: We need to read the Bible through the lens of prayer, seeking God’s Holy Spirit to guide our thoughts, direct our contemplations, and inspire our conclusions. Without Holy Spirit assistance, the words of the Bible become little more than words and our reading has limited merit. As we read the Bible, we plant seeds in our mind, but God makes these kernels of truth grow. We see this principle of God as the source of growth in 1 Corinthians 3:6-7. 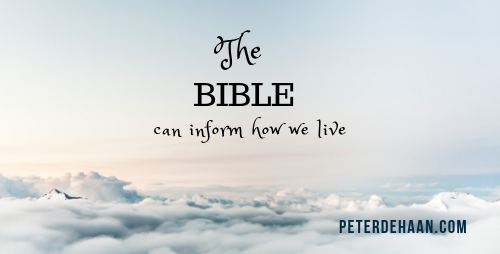 Though the Bible can provide direction for our lives, we need to be wise in how we apply it.